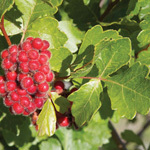 Excellent bird seed, red fruits, and brilliant foliage are a plus. Mow around this thicket forming shrub to curb its spread. Q: Why is smooth sumac one star? Is it hard to take care of and be in a normal backyard of a house? A: Smooth sumac is highly rhizomatous and will overtake a formal flower bed. The star rating we've assigned corresponds to the aggressive nature of the plant. 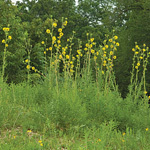 It is an excellent plant for wildlife. The flowers attract many bee species and other insects. Deer and rabbits will browse the plants, and birds consume the berries. The fall foliage turns a gorgeous red. Smooth sumac definitely has some nice qualities, but it needs its own space. 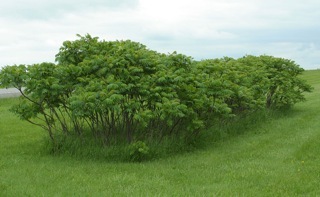 Mowing around a sumac planting will help keep the colony confined.